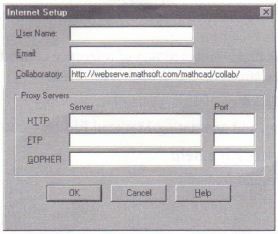 • Networking software to support a 32-bit Internet (TCPIIP) application. Such software is usually part of the networking services of your operating system; see your operating system documentation for details. 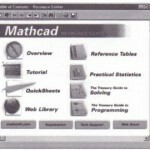 What you need to connect to Web-based resources from within Mathcad. 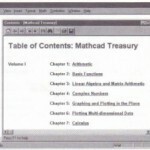 How to retrieve and post files to the Collaboratory, a Web-based service for communicating with other Mathcad users. The Electronic Book that is both a library of reference content on your desktop and a gateway to resources on the World Wide Web. Opening, navigating, and annotating Mathcad Electronic Books. On-line Help on product features. • Your name, which will appear on any Collaboratory messages you send from within Mathcad. 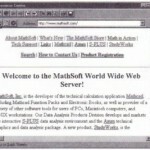 • Your Internet electronic mail address, which will appear on any Collaboratory messages you send from within Mathcad. The URL for the Colla bora tory server you contact when you choose Collaboratory from the File menu.